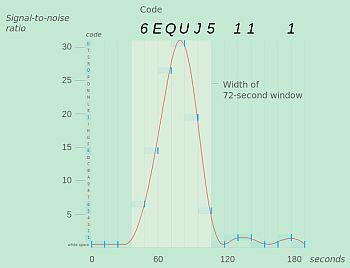 The Wow Signal - a message from extraterrestrials? 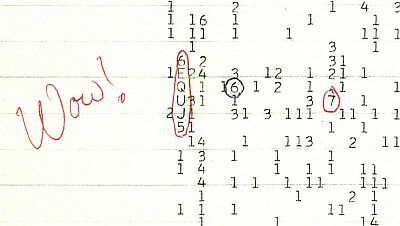 The Wow Signal is possibly the only candidate, so far, for being an artificially created message, emanating from space. If all other possibilities for its origin are discounted, that must be the only remaining conclusion to be drawn. During the years 1973-1983, Ohio State University's observatory, containing a radio telescope affectionately known as "Big Ear", was utilised in a programme to listen out for evidence of alien intelligence. The results consisted mostly of static and white noise, with the occasional small peak. Then, in 1977, a huge peak was received, so much so that the astronomer manning it at the time, Jerry Ehman, was prompted to write "Wow!" next to it, thus giving it its name. So, what was there about that enigmatic sequence of letters and numbers that excited Ehman? Let's interpret the data. Okay, so you've got 6EQUJ5. These represent the various strengths of the signal. 1 is the lowest you can go. The scale goes up to 9 then changes to letters of the alphabet, so the strength of U is very high indeed. This graphic shows the peak more clearly. As you can see, it is huge, bounded on both sides by either zeros or ones. No wonder Ehman wrote "Wow!". But, is it real? The signal was broadcast on the frequency of the "hydrogen line" - approximately 1420.4MHz. As hydrogen is the most abundant element in the Universe, it is thought that any alien civilization would use this frequency. Also, it is a banned radio frequency for aircraft and spacecraft, as it is reserved for astronomy purposes. The Big Ear used two "feed horns" to collect any radio beams and they searched the sky three minutes apart. Only one horn received the signal. Three minutes later, it had gone. Of course, this could simply be because the transmitting aliens pointed it in a different direction, or actually turned it off, during those three minutes. For many years afterwards, other radio telescopes, far more sophisticated than Big Ear, scanned the sky in the area from which the Wow Signal came, without success. It does seem likely that the radio emission did come from deep space - somewhere in the constellation Sagittarius. The star nearest to the signal's coordinates is Tau Sagittarii, at about 122 light years from Earth. Whether the Wow Signal was sent by intelligent aliens or just a result of a freak astronomical occurance is still unknown, but the fact that it hasn't been detected again is disheartening. That still doesn't rule it out totally, though. It has been estimated that for a signal to reach us from so far away, the aliens who may have sent it must have in their possession a transmitter of some 2.2 Gigawatts, far more powerful than any on Earth. This might indicate, if they existed, that they are a lot more advanced, technologically, than we are. Well, Do Aliens Exist Or Not? It was renowned science fiction author, Arthur C. Clarke, who once remarked, "Two possibilites exist: either we are alone in the Universe or we are not. Both are equally terrifying". This is, of course, true. Which is more probable, though? Are we the only intelligent species in the whole of the Universe? Surely not! There is evidence of micro-organic life on Mars and some asteroids. This is how life started out on Earth and it managed to evolve into human beings. So, it seems more than likely (though by no means certain) that intelligent life does exist elsewhere in the Universe. But, if that is the case, we are then faced with Fermi's Paradox. Stated quite simply, Fermi's Paradox is that, given the age and size of the Universe, many advanced extraterrestrial civilizations should exist. So, why has the human race never experienced any evidence to support this? Physicist Enrico Fermi expressed it more succinctly: "Where is everybody?". There are innumerable stars in our galaxy older than our Sun. Many are likely to have Earth-like planets orbiting them, where intelligent life far more technically advanced than us will have had time to evolve. It is said that, for a species capable of interstellar travel, the whole of the Milky Way galaxy could have been completely colonized within a few tens of millions of years. Why, then have we never been visited, by either aliens themselves or their unmanned probes, or contacted? Hang on, you might be thinking. What about UFO sightings? Well, all but 1% of UFO reports can be explained away as military aircraft, weather balloons and other things like Chinese lanterns. Until there is incontrovertible proof of the presence of alien craft in Earth's airspace, we'll have to allow the Fermi Paradox to stand. One possible answer is that any technologically advanced species ends up destroying itself, sooner, rather than later. So, due to the vastness of the cosmos, there's just not enough time for them to contact us. It's a depressing thought, isn't it?